Bartolo Colon is now a power hitter, but he’s always been a source of wisdom and knowledge. As the wizened sage of the Mets’ pitching staff, his job is to lead by example. Apparently content with his teachings on how to dominate from the mound, it appears Bartolo has moved on to teaching his flock how to mash dingers. His pupil Noah Syndergaard, a terror on the mound, took his lessons to heart and jerked two dongers in tonight’s game against the Dodgers. Here’s the second with the Vin Scully call. Syndergaard just does everything at maximum velocity. Tonight, May 11, 2016 Noah Syndergarrd, Mets Pitcher hit 2HRs. May 11, also happens to be Walt Terrell’s birthday. Mind blown? You just wait. Syndergarrd’s 2nd HR was a 3 run HR. The last Met pitcher to hit a 3 run HR? Ron Darling who was traded to the Mets from the Rangers with Walt Terrell. Ron Darling did the color for the Met TV broadcast tonight. 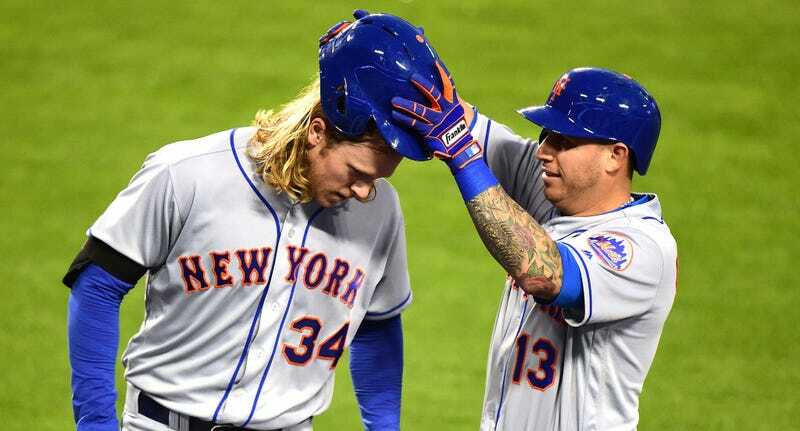 What will Bartolo get Young Thor to do next?